Thu, Apr 25, 2019, 20:42:58 ---- The fact: 42.844.000 visitors done. One of the largest, privately owned manufacturers of spiral pipe in China has placed a large repeat order for laser-based weld seam tracking systems from Meta Vision Systems, whose headquarters and factory are located near Oxford. The mill first purchased two of Metas VistaWeld laser guidance systems towards the end of 2006 to automate the welding process during pipe manufacture. Now it has decided to take advantage of the weakness of Sterling to equip its entire factory with the systems. Commented Bob Beattie, Metas managing director, Given that the customer had experience with our systems for two years, the fact that it is willing to spend such a significant sum during a global recession suggests that the VistaWeld system is providing excellent performance, demonstrable value and a proven return on investment. "We feel that the latest order is a huge vote of confidence in our technology and products." Meta is celebrating its 25th anniversary this year, having been spun out of Oxford University in 1984, since which time it has grown to be the leading global supplier of laser guidance systems to the pipe manufacturing industry. In recent years, it has been particularly successful in penetrating the important Chinese and Indian markets. Metas dual VistaWeld system uses a single integrated panel to control the individual laser sensors and servo slides of the two heads that simultaneously weld the inside and outside diameters of the pipe. The dual control system reduces the overall investment cost and increases system reliability. Colour touch-screen graphical interfaces provide mill operators and maintenance staff with easy to understand information on system performance and status. The operator interface has been rewritten using Chinese characters to adapt the control for the Chinese market. Beattie added, "Following three record quarters, and in common with much of manufacturing industry, we experienced a sudden decrease in business volume in the last quarter of 2008". "Against this backdrop, the latest Chinese order and a number of smaller orders we have received recently from other countries are very encouraging. They indicate that the combination of a good product, local service and aggressive pricing provides an attractive package to customers that will enable us to continue to develop our company throughout 2009". "We feel that this order has a certain symbolic resonance, coming as it does at the start of the Year of the Ox, which is also the symbol of Oxford." 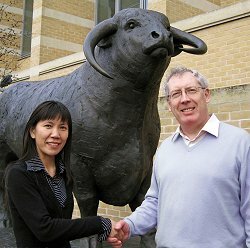 In a recent visit to Oxford, Metas Chinese partner, Mr Richard Liang of RDC Group, Metas Chinese area manager, Dr Jing Zhao and Bob Beattie celebrated the start of the Chinese New Year by visiting the Ox statue at Oxford Universitys Said Business School.